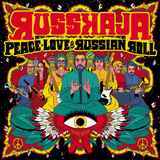 I will start my review of Peace, Love & Russian Roll by Russkaja where I left off discussing their debut Energija!. Russian Channel 1, TV Channel we watch sometimes on our satellite TV, is mostly a mouthpiece of the current Russian government, so we avoid the news which is mostly propaganda. Yet once in a while they have an apolitical game or entertainment show. One such recent project was called Three Chords, the Russian equivalent for something very simplistic in terms of music. In this show different vocalists of varying quality were singing what Russians term chanson, genre broadly covering folk, pop, street, gang and prison system songs (Russia has enormous plethora of the latter three given degree of incarceration its population had to go through). Why am I bringing Three Chords up? Because Austrians Russkaja, who are made up of some Russian/Ukrainian/Georgian emigrants, would have been right at home on that program due to their repertoire and presentation style. Russkaja debut Energija! was pretty authentic, had little to do with metal, somewhat fun, but did not shake my foundations and did not make me put it on repeat. The second installment Peace, Love & Russian Roll is still authentic, still has nothing to do with metal, yet is much more fun because the album is now littered with verifiable hits which I can either listen to multiple times myself or offer them to my family and friends. The bookends Rock’n’Roll Today and the title track are energetic pieces which you can call rock'n'roll only if you stretch that notion to something they dance to in Odessa or Brooklyn and lovingly call 7:40 (you have got to be a local to understand). At any rate, Rock’n’Roll Today and the title track are uplifting, but not ground breaking, and only set the table for me. Slap Your Face, Hometown Polka, There Was A Time, and El Pueblo Unido is where Peace, Love & Russian Roll won me over, delivering that combination of fun, romantic and tongue-in-cheek feeling Russkaja is striving for. Funky rhythms of Hometown Polka, exaggerated acoustic strum in There Was A Time, Cuban Communist El Pueblo Unido, all coming one after another with melodies to savor and enjoy made the whole of Peace, Love & Russian Roll not only palatable, but worthwhile. From there, tacky love songs Lovegorod (in Russian) or Parachute (in English) don’t look so sappy. Pained bluesy track Salty Rain can be taken seriously, and country mockery Radio Song is not so ridiculous. Throw in a fantastic Gypsy-themed romance Let’s Die Together (Mon Amour), with characteristic guitar playing and tempo changes, and there is a lot to remember about Peace, Love & Russian Roll. Production on the album is still pretty clean, so everything can be heard, but tilts towards the heavy rock edge. And to hear individual instruments is definitely a positive on Peace, Love & Russian Roll, since Russkaja makes much better use of their Jewish/Gypsy sounding violin (Hometown Polka, Let’s Die Together (Mon Amour)) or wind/brass section (Slap Your Face, El Pueblo Unido) than they did on the debut. Orchestral instruments are now integral parts of Russkaja, not oddities brought in for the sake of just that. Idealistic? Surely, but I was happy Peace, Love & Russian Roll was my soundtrack of the week.